Today's post is a simple shiny card with lots of texture! I wanted to created a card with some layered snowflakes. I started with the Winter Wonder Embossing folder and a smaller piece of Whisper White cardstock. 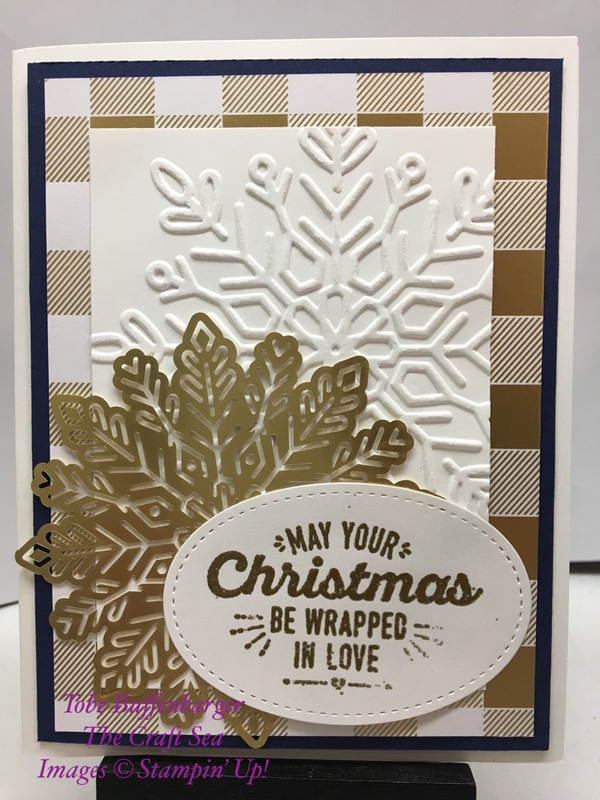 Next I layered on a gold foil snowflake. From there, I heat embossed my sentiment in gold and die cut it using the Stitched Shapes Framelits. I bought this framelit set last year and am constantly amazed at how often I pull it out to use. Definitely one of my better investments! Finally, I needed some more shine, so I pulled out the Year of Cheer DSP pack. I was going to use the gold snowflake pattern, but this plaid was the better choice -- a nice contrast to the repeating the snowflakes. For a pop of color, I added a layer of Night of Navy cardstock. and place the whole thing on a white card base. Love this shiny card!